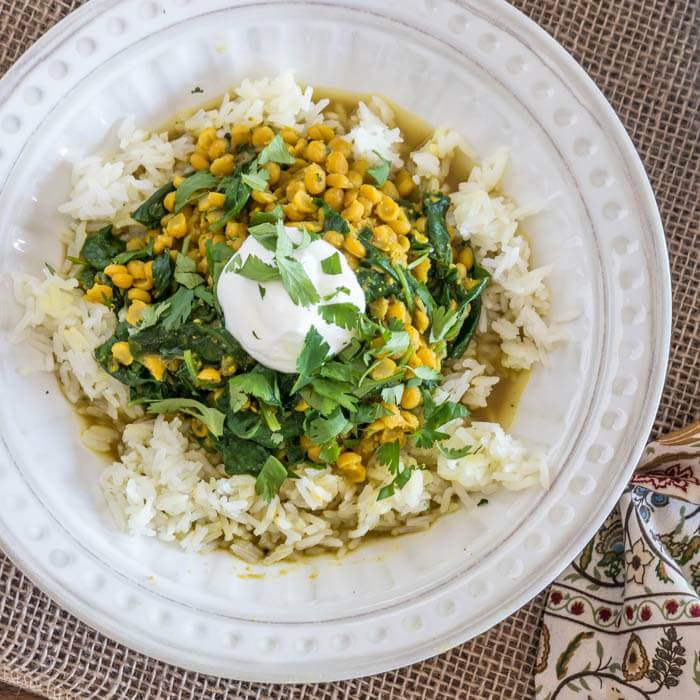 Savor the spices of India, chana dal, and spinach in this healthy vegetarian dish. 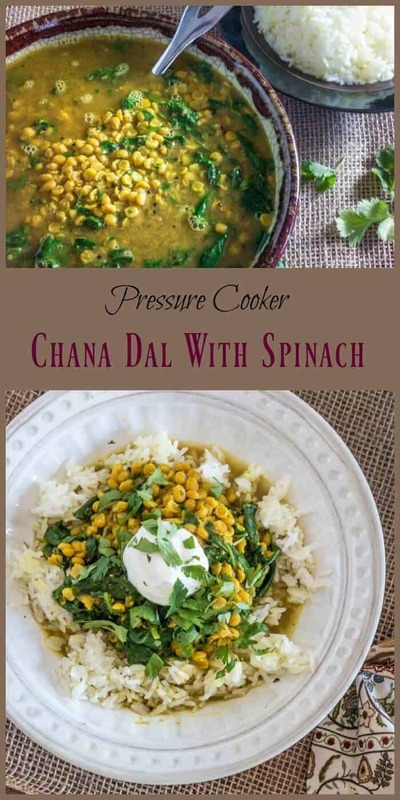 Pressure Cooker Chana Dal With Spinach cooks quickly, and packs so much flavor. It’s sure to be a favorite for #MeatlessMonday or any day when you’re looking for a filling and comforting bowl of vegetarian goodness! This recipe first appeared on Pressure Cooking Today where I am a contributor. 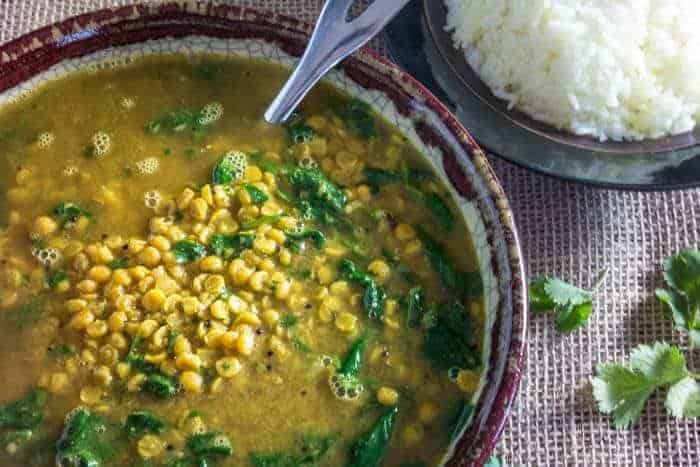 Pressure Cooker Chana Dal With Spinach is an adaptation of a recipe you may remember from the early days of my blog… Or maybe not, as I was still feeling my way around the food blogosphere! 🙂 Chana Dal With Spinach is basically the same recipe – one I’ve made for years – cooked on the stove top. Having become more interested in pressure cooking, I thought it a perfect recipe to adapt. Whatever your cooking method preference might be, you’re sure to love the flavors in this somewhat traditional Indian dal recipe. I have to admit that I am too often guilty of thinking “inside the box” when using my pressure cooker (i.e. quickly cooking meats that need tenderizing), so I am loving the challenge of expanding my horizons. This vegetarian dal has no meat, but the pressure cooker has dry, unsoaked beans ready in a fraction of the time required on the stove top. Chana dal is my favorite of all of the Indian pulses. Pulses include beans, lentils, and peas. “Dal” is a split pulse. Chana dal is a split chick pea. Read A Guide to Indian Dal, Lentils, Beans, and Pulses for an in depth look at Indian pulses. 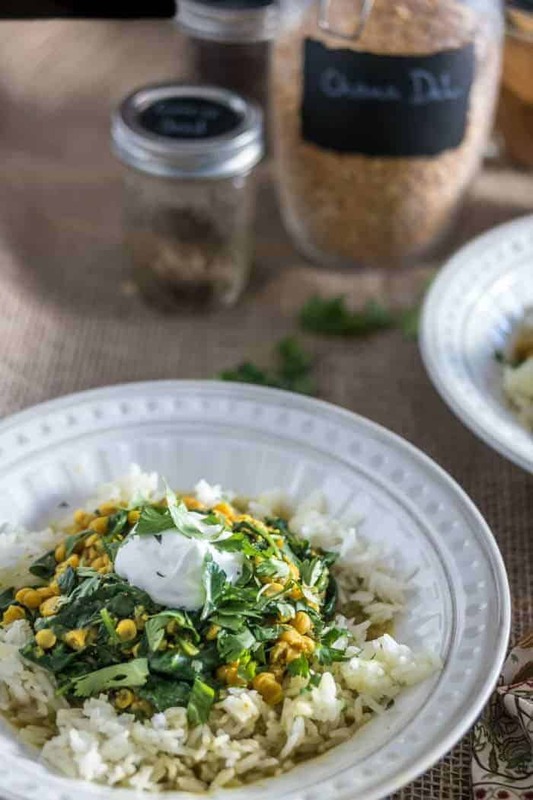 Chana dal retains its texture longer than many of the pulses I have cooked with, and I love the textural contrasts in this dish – creamy Greek yogurt, wilted fresh baby spinach, and the al dente chana dal. Served with fluffy basmati rice, it provides complete proteins, and is loaded with nutrients and fiber. This entire dish can be completed in the pressure cooker. I have a stove top Presto cooker, but since moving to a house with a glass cook top, I rely more on my Power Pressure Cooker XL. If you’re cooking on a glass cook top, you’ll want to use two burners to avoid problems associated with burners that don’t respond quickly. Once the cooker comes to pressure, move it to a pre-heated burner. Mine works best on a fairly low setting, but it will depend on your cook top. Most electric pressure cookers have the ability to sauté in the pot prior to pressurizing. You may have a special button for sauté, but mine will sauté on any setting as long as the lid is off. The onion/ginger/garlic mixture gets sautéed in a bit of oil, then the black mustard seeds, red chiles, and freshly ground spices are added. Lastly, add the rinsed and sorted chana dal, and the broth or water. Lock the lid, and pressurize according to your model’s instructions for beans/legumes. Then, do a quick natural release of about 10 minutes. Stir in the spinach, and serve over basmati rice. Garnish with a dollop of plain Greek yogurt and a sprinkling of chopped cilantro. I think you will be amazed at the slow-cooked flavors this dish develops in such a short amount of time! Take a minute to inspect the dal and rinse them. Place them in a large pot, and cover with water to about 2 or 3 inches above the dal. Add about 1 teaspoon of salt. Bring to a boil, then turn heat to keep a simmer. Keep an eye on the water as they will absorb quite a bit. When the dal is tender but not soft, drain, rinse, and set aside. Add coarsely chopped ginger, garlic, and onion to the bowl of your food processor. Pulse until the mixture is pureed. In a spice grinder (or mortar and pestle), grind coriander, cumin, and fenugreek. In a heavy dutch oven, heat the oil on high. Add black mustard seeds. Stir with a wooden spoon until the seeds begin to sizzle and pop. Add pureed ginger, garlic, and onion. Stir until mixture is very fragrant - about 2 to 3 minutes. Be careful to not burn it. Lower heat if necessary. Add ground spices, Fresno chile (cayenne or dried chile), garam masala, and turmeric. Stir until combined, and you smell the sweetness of the spices cooking - another couple of minutes. Add cooked dal and broth to the pot. Lower heat to a simmer, and cover. Cook 15-20 minutes to allow flavors to marry. 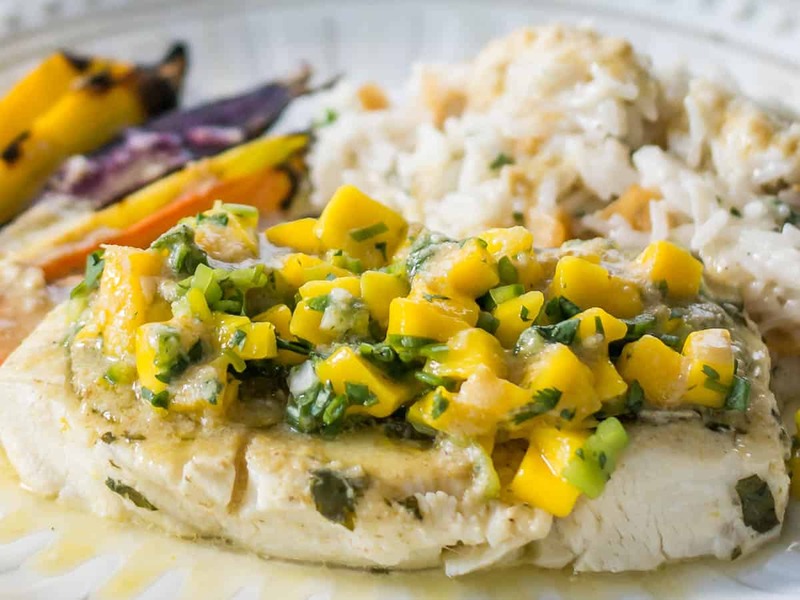 Tropical Pressure Cooker Fish In Banana Leaves (Or Parchment) – Tender white fish with a Thai curry marinade cook lightening fast in the pressure cooker, and get topped with a fresh mango salsa. 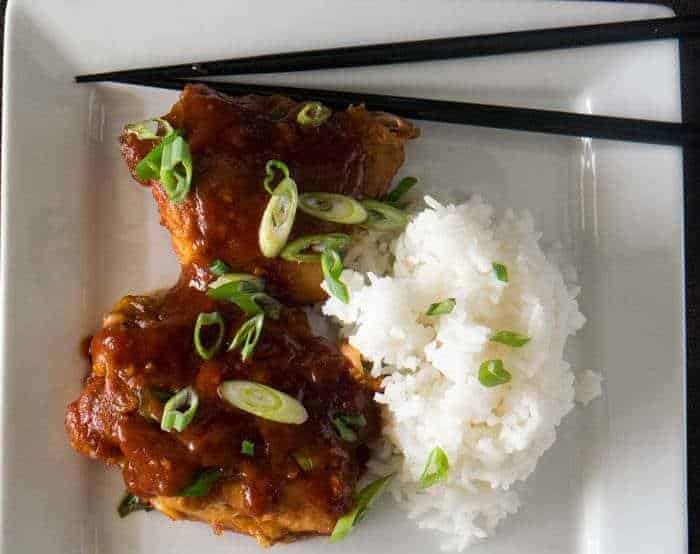 Korean Chicken Thighs In the Pressure Cooker – The salty, spicy, umami, and sweet flavors of Korean gochujang provide the base for this savory, saucy, succulent recipe for chicken thighs. Is the fenugreek the seed or dried leaves? Thanks! Hello Tamara! I saw your comment on Sue's Hatch Green Chile Dip recipe using our Hatch Green Chile. Our store front is actually in Las Cruces but we harvest our Green Chile in Hatch. I cannot imagine moving away from this town for many reasons including my newfound love for Hatch Green Chile. HEB is a wonderful store but I'm sorry that they didn't supply Hatch Green Chile for you this year. Instead, we would love to ship you a free box of our Hatch Green Chile to say thank you for talking so highly of our delicious chile. If you're interested, please send me an email! Thanks for contacting me Ashley! 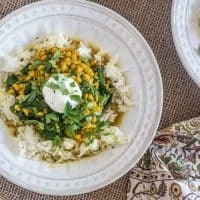 YES, YES, YES to the Hatch green chile! You just made my day. I love dal and this looks fabulous Tamara! It's so beautifully golden. I love that its all made in the pressure cooker too. I've never used one but I've had one on my wish list for a while as I love the thought of making speedy vegetable stocks in them as making stock the traditonal way each weekend takes hours. Do you recommend a stove top pressure cooker or a powered unit?